A RUSSIAN UFO researcher is calling for an investigation after declassified files from the Soviet era detailed cases of terrifying incidents alien encounters. The experiences listed in the documents are similar to the ones reported in the region of the Bermuda Triangle, one of the world’s biggest mysteries, reports Alien Revelations. According to the declassified Russian Navy records, unidentified submerged objects (USOs) have been spotted within the Earth’s oceans. The technologically advanced objects are far superior to anything we’ve ever built, the website adds. One of the most interesting cases Mr Azhazha examined, involved a nuclear submarine on a combat mission in the Southern Pacific. During the routine operation, the submarine detected six unknown objects travelling in formation at speeds in excess of 230 knots (265+ mph). In comparison, the fastest submarine was the Soviet K-222, which reached about 44 knots (51 mph). 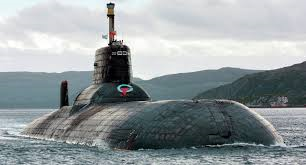 The objects were believed to be headed straight for the Soviet submarines, which were therefore forced to surface. But the USOs followed them to the surface and then flew away. Retired submarine commander Yuri Beketov recalled similar instances in the region of the Bermuda Triangle. Mr Beketov said on-board instruments often malfunctioned, indicating the presence of strong interference. which many believed was a clear sign of USO and UFO presence. Mr Beketov said: “On several occasions the instruments gave reading of material objects moving at incredible speed. Calculations showed speeds of about 230 knots, or 265 mph. Vladimir Azhazha believes the issue should be thoroughly investigated. He said: “I think about underwater bases and say: Why not? Nothing should be discarded.